This tasty and very satisfying pasta dish is brought to you courtesy of Chop Sizzle Wow; a new cookbook bringing together 50 quick and easy classic Italian recipes from the bible of Italian home cooking, The Silver Spoon, in a fun and engaging cartoon format. I was sent a review copy, and as the press release said it is perfect for cooks young and old, I decided to put the children to work testing out one of the recipes. More chopping action – watch those fingers Mia! Our chosen recipe was rigatoni with meatballs. 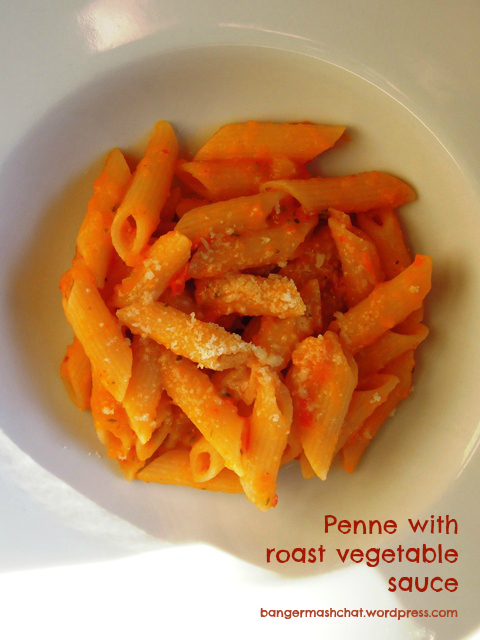 Except we didn’t have any rigatoni, nor did the corner shop, so we went with penne instead. 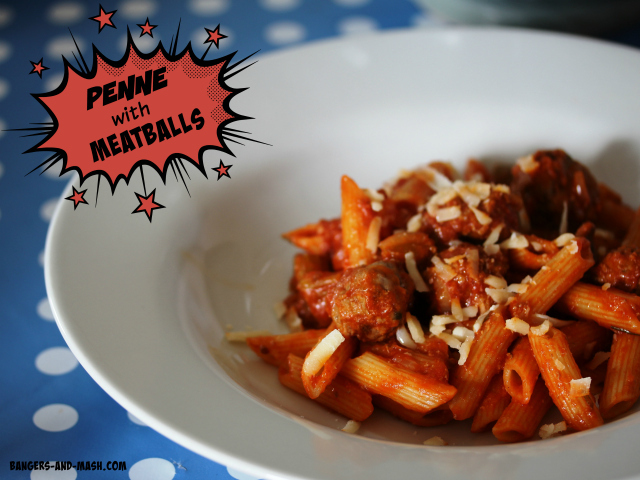 Jess and Mia loved the cartoon concept of the book and found the recipe fairly easy to follow, but they definitely needed some adult assistance from time to time; such as when they couldn’t get the meatballs to fry and brown without them disintegrating. At this point I stepped in and cooked up the meatballs in a separate frying pan. But all in all the dish was a resounding success and the end result was very good. I think it’s one the kids will want to cook again. Oh, and they also have their eye on several recipes in the desserts section, such as the Chocolate Delight and the Stuffed Peaches. 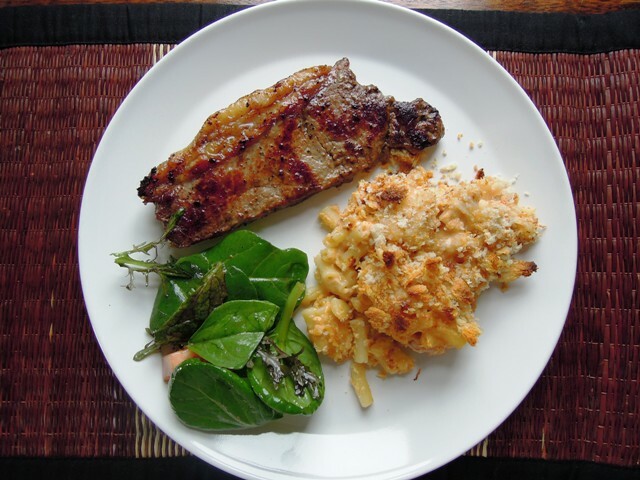 The recipes in Chop Sizzle Wow are brilliantly simple and very easy to follow, although you probably do need a little kitchen nouse to fill in some of the gaps. 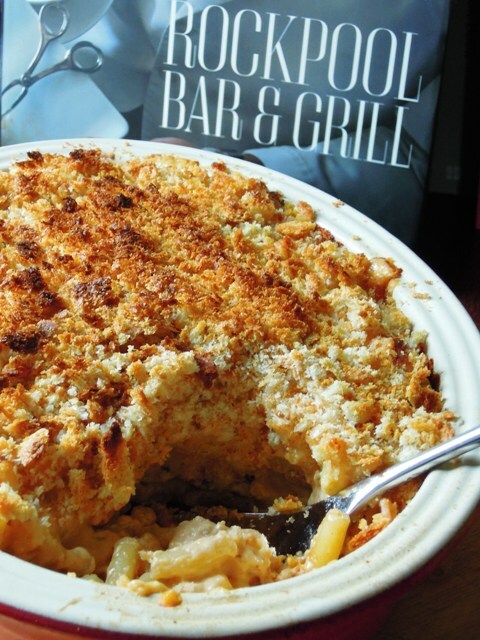 The book is divided into five sections: appetizers, pasta, main courses, deserts and baking, and extra stuff. There’s also a witty introduction giving an overview on how Italians cook and eat. The illustrations by Brazilian illustrator and artist Adriano Rampazzo (a recent graduate of London’s Central St Martin’s art college) are fantastic and I’m sure this book will appeal to comic book fans, as well as those looking for an easy introduction to Italian cookery. I think it would make a great Christmas present for students returning to their uni digs after the holidays. Chop the carrots and celery. Mix the meat, parsley and garlic. Then season and mix in the egg. Shape into small balls. Dust with flour. Heat the olive oil in a frying pan on a low heat. Cook the onion, carrot, celery and rosemary for five minutes on a low heat. Season and add the passata. Simmer for 40 minutes, stirring occasionally. Bring a large pan of salted water to the boil and cook the pasta for 10 minutes, or according to packet instructions. Drain the pasta, then add to the meatballs. Gently stir together and serve, topped with pasta. 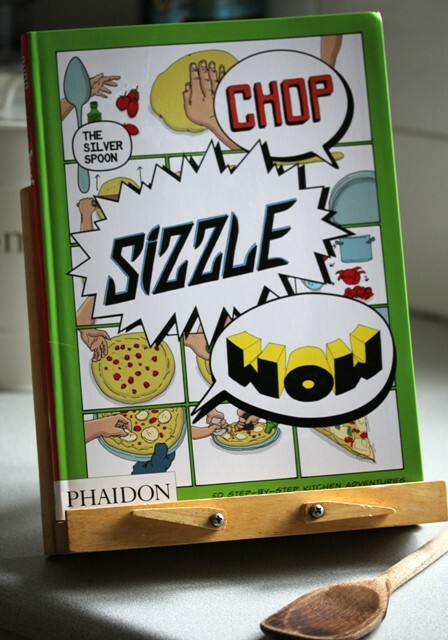 Chop Sizzle Wow is available from the Phaidon online store and costs £12.95. As this dish is a perfect one for older children to make themselves, I am entering it into the Family Foodies challenge, which I host with Eat Your Veg, where the theme for October is Cooking With Kids. Disclosure: I was sent a complimentary copy of Chop Sizzle Wow from Phaidon Press for review purposes. No money exchanged hands and all opinions expressed are my own. 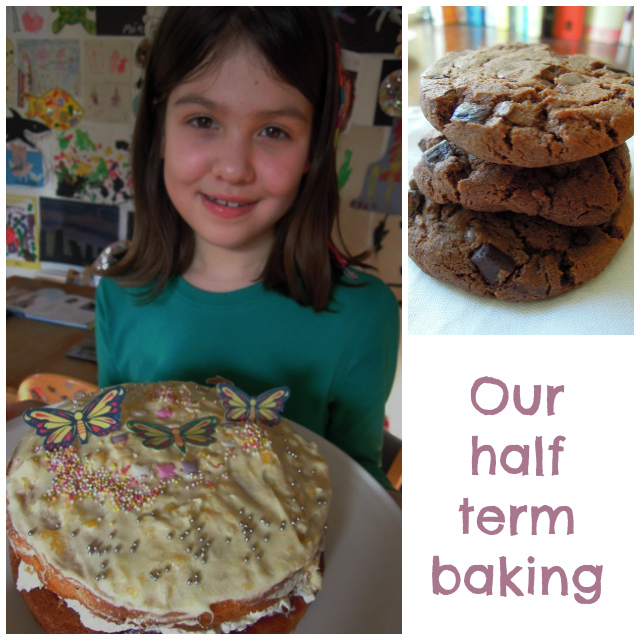 We’re nearing the end of the school half-term holidays. It’s been a lovely week of movies (Mr Peabody and Sherman in 3D at the cinema and Cloudy with a Chance of Meatballs 2 on DVD, both of which get a big thumbs up from my girls), baking (my eight-year-old Jess created a superb Victoria sponge with her very own recipe mango buttercream topping, while Mia elected to make double chocolate chip cookies although Mummy did most of the work), library outings, times tables testing, story writing, soft toy safaris, Sir Frances Drake research, and dance shows. Jess and Mia have been rehearsing for months and months for their big dance show with the Susan Hill School of Dancing. 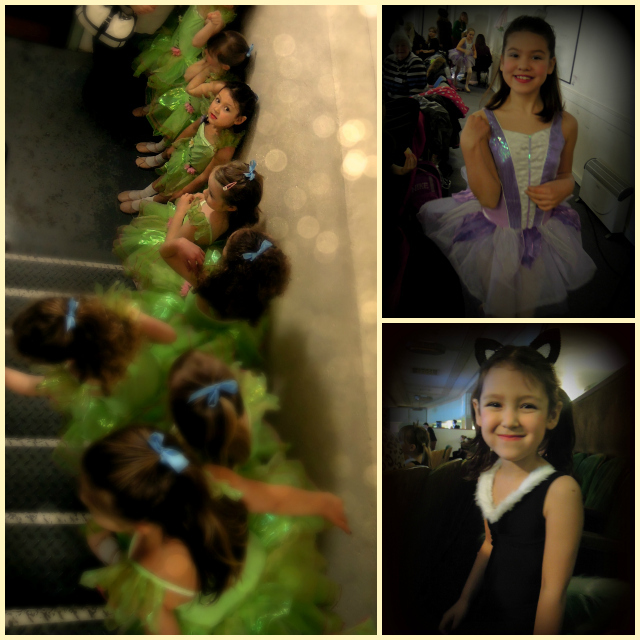 This finally culminated in much-anticipated performances at the end of the half term break at the Forum Theatre in Bath. The girls and their friends had a day of dress rehearsals on Thursday, followed by matinée and evening shows on Friday and Saturday. I helped out back stage on the Thursday and Friday, which was great fun but truly exhausting. I thought being responsible for two children was full on, but looking after a group of 13 five-year-old girls was something else, and not to be repeated too quickly! Sadly, Jess was forced to miss her Saturday performances as she fell ill with a bug – she was absolutely gutted, but at least she got to dance on the Friday. Unfortunately I didn’t get to see her as I was back stage, although friends who were in the audience tell me she danced beautifully. So this weekend, poor old Jessie has spent most of the weekend on the sofa under a duvet. She’s off her food – always a sure-fire sign she’s unwell – although I have succeeded in tempting her with a little fresh melon and chicken soup with rice. I’ll post the recipe for the soup very soon. Earlier in half-term week my mission had been to feed my two ballerinas with lots of nourishing food to keep their energy levels up for all that dancing. And so the obvious dinner after their gruelling Thursday of dress rehearsals had to be their all-time favourite, spaghetti Bolognese. 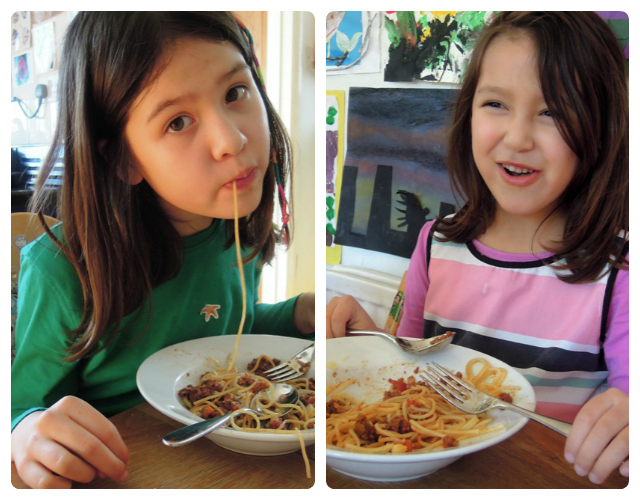 Spaghetti Bolognese has been both of their favourite meals since they were old enough to pick up a fork and spoon. Whenever I make it, I always make sure there’s some left over to go in the freezer for an easy supper another day. 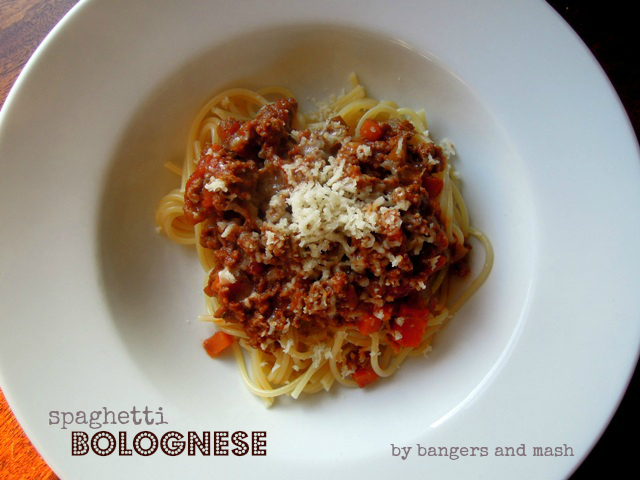 Everyone has their own Bolognese recipe. Mine varies depending on what I have in the house. Sometimes mine will have a drop of red wine in there, and sometimes it won’t. Sometimes there will be peppers or mushrooms (much to Jessie’s dismay as she’ll have to pick them out), or perhaps some smoked bacon. If I have a Parmesan rind lurking in the fridge, I’ll chuck that in during the cooking to give it a scrumptious flavour boost. I don’t always add caraway seeds, but I thought I would this time so I can enter it into this month’s Spice Trail challenge, which has caraway as its theme. I think the caraway adds a lovely intense and slightly sweet flavour to the Bolognese, and I quite often use it in casseroles and other slow-cooked meat dishes. Heat the oil in a large saucepan and gently fry the chopped onions, carrots and celery until soft – around five minutes. Add the garlic and fry for a couple more minutes before adding the minced beef. Stir to break up any lumps and cook for two to three minutes until browned. Pour in the chopped tomatoes. Half fill the tomato tin with hot water and pour into the pan. Sprinkle in the beef stock cube, or ‘plop’ in the stock pot. Add the caraway seeds, a dash of Worcestershire sauce and the Parmesan rind if you happen to have one left over. Give it all a good stir and allow to simmer for half an hour or so. If it starts to look dry, add a little more water. Before serving, give it a taste and add a little salt and pepper if needed, and remove the Parmesan rind if used. 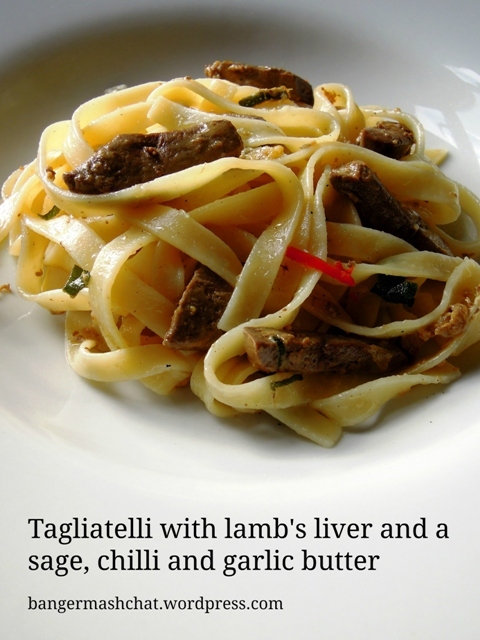 Serve with pasta, ideally spaghetti, and a grating of fresh Parmesan cheese on top. 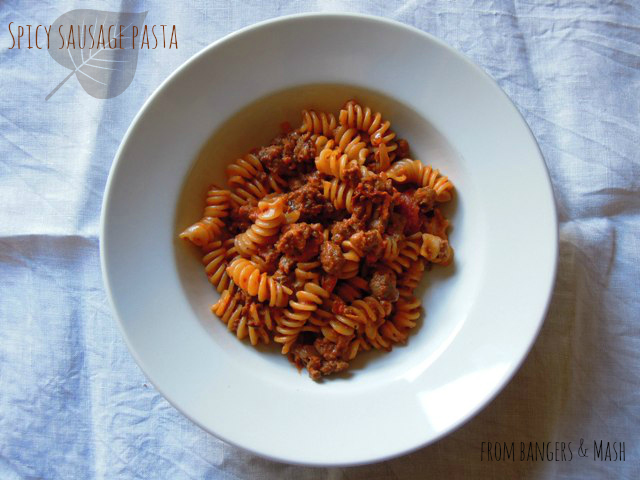 I’m adding this Bolognese to February’s Spice Trail, hosted by yours truly, as it features caraway seeds. 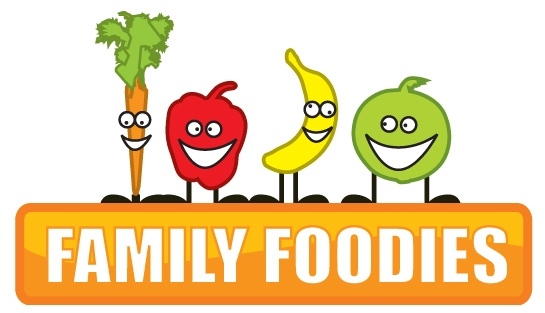 I am also sharing this with February’s Family Foodies, hosted by Eat Your Veg and me, which this month has a Love theme. 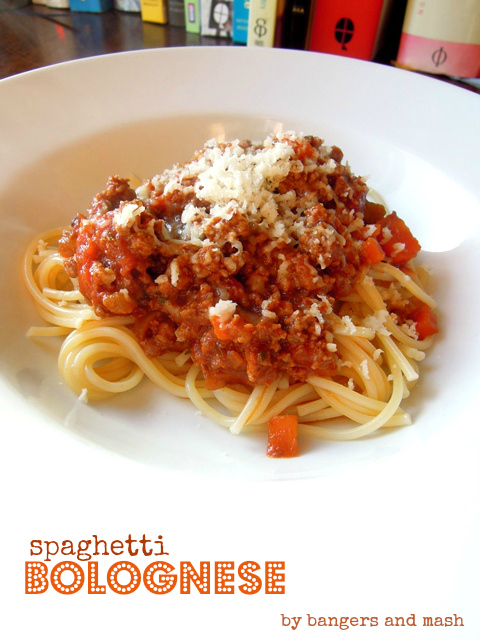 Spaghetti Bolognese is definitely a dish cooked with love for my loved ones, big and small. This is my go-to recipe when we have friends coming over for dinner but I just don’t have time to cook anything too elaborate. 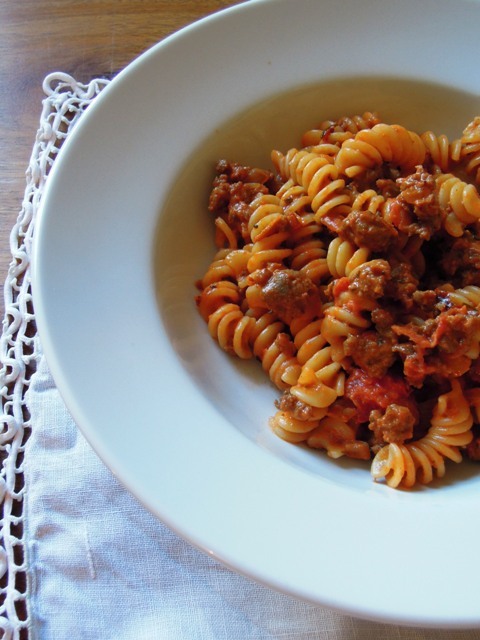 It’s such a simple pasta dish – it’s central ingredient is the humble sausage after all – but honestly, it tastes a million dollars and always impresses. 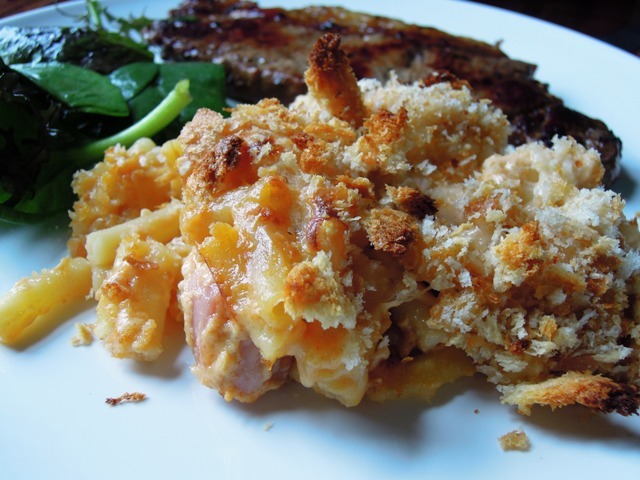 It is full of deep, smokey flavours – rosemary, oregano, chilli and paprika – while the cream and Parmesan give it a wonderfully indulgent edge. With a large glass of Chianti, this is my perfect dinner party dish. Just make sure you buy the best pork sausages your budget can stretch to. The children love it too, but I generally ease back on the dried chillies when I cook it for them. Heat the olive oil in a large pan and gently fry the onion until soft. Add the sausage meat, rosemary, bay leaves, chillies, oregano, paprika and garlic, and fry together over a medium heat. Stir well to break up the sausages. Continue to fry for around 5 minutes until the sausage is browned. Pour in the tinned tomatoes, give it all a good stir and bring to the boil. Simmer gently for 15 minutes, stirring every now and again to help break up the tomatoes. Meanwhile cook the fusilli according to the packet instructions, and drain thoroughly. Stir the double cream into the sausage sauce. Pour the pasta into the sauce, along with half the Parmesan, and mix well to make sure all the fusilli is well coated in the sauce. Serve with the rest of the Parmesan sprinkled on top. And tuck in immediately. Or keep warm until your guests arrive. 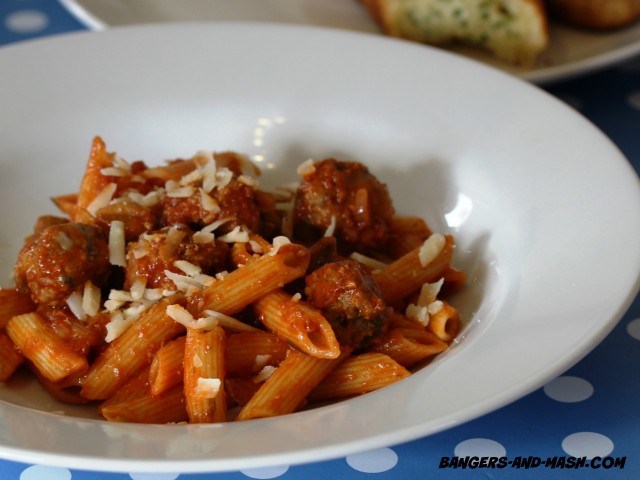 Paprika is one of the key ingredients and so I am entering this spicy sausage pasta into this month’s Spice Trail challenge. I have been cooking this sauce, or versions of it, since I was weaning my two girls onto solids. They are now five and eight and still enjoy it just as much, although the portion sizes are considerably bigger now. 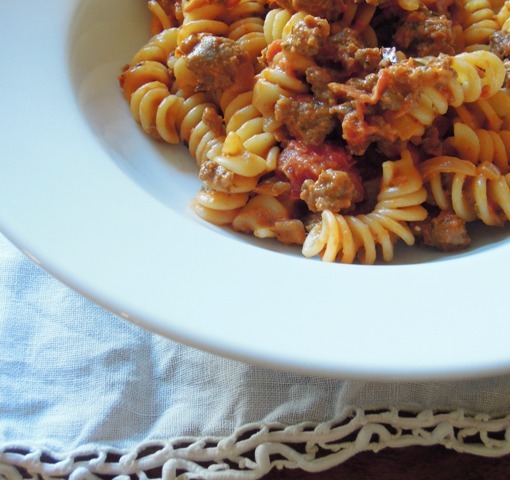 Back in the early days, they would eat the sauce on its own and as they grew older I started stirring it into penne or fusilli to make a delicious pasta sauce. They still love it this way, especially with a huge heap of grated cheese on top, along with a drizzle of olive oil. It’s one of the easiest sauces in the world to make. All the ingredients are simply roasted in one pan and then blitzed in a food processor with some stock. I don’t even bother to peel the garlic. It’s extremely adaptable too and you can experiment with whichever vegetables take your fancy – or whichever vegetables you might be trying to sneak past your unsuspecting fussy eater. I generally cook up a big batch of this sauce and freeze it in individual portions; perfect for a quick tea after school when the kids have clubs to rush off to. 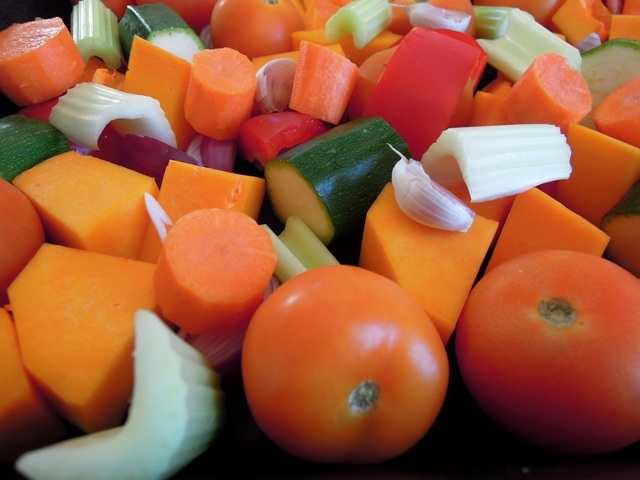 Place the tomatoes, chopped vegetables and garlic into a large roasting tray. Drizzle with olive oil and give it all a good mix to make sure everything is thoroughly covered. Roast in the oven for 30 to 40 minutes until the vegetables are tender and beginning to char a little. Put the vegetables into a blender with the stock and blitz until smooth. Job done. 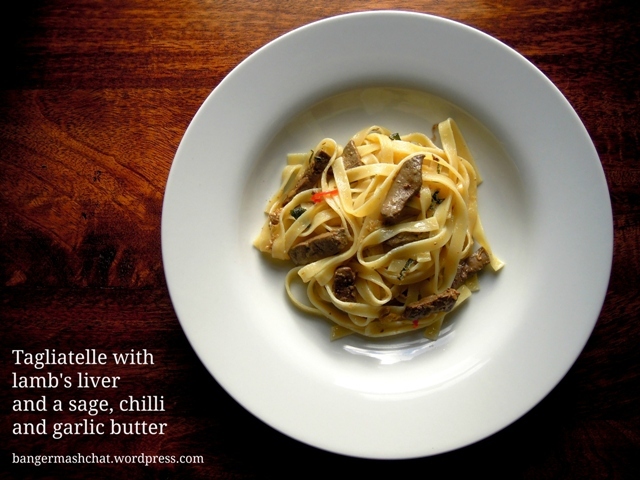 Simply stir into cooked pasta for an easy peasy supper. Freeze the remainder of the sauce in individual portions. You should get around 12 portions out of it. 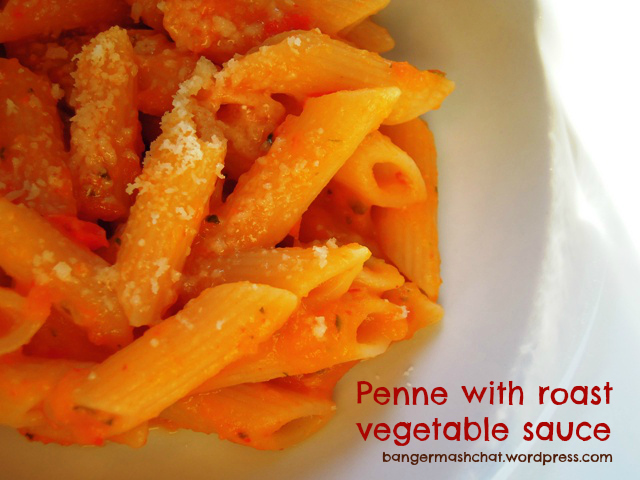 As this pasta sauce is an ideal way to introduce your children to vegetables and entice them to eat a few they might not be so keen on, I’m entering it into this month’s Family Foodies challenge, where the theme is ‘Hidden Goodies’. We’re getting a steady crop of broad beans from our veg patch at the moment, along with peas, sugar snaps and courgettes. The cucumbers don’t look far off from picking either; it’s the first year we’ve tried growing them from seed and they’re proving much easier than I thought they would. Those are famous last words of course. They’ll probably develop some nasty disease now I’ve said that and get completely wiped out. Let’s hope not. Quickly boil the broad beans in salted water for two to three minutes until just tender. Run under cold water to stop them cooking further and to cool them down a little before double-podding. Yes, it’s a bit of a faff but it’s well worth it. Then mash the beans roughly, using either a fork or a potato masher. In a bowl, mix the mashed beans with the mascarpone, lemon juice, most of the thyme, a good amount of salt and pepper and a drizzle of olive oil. 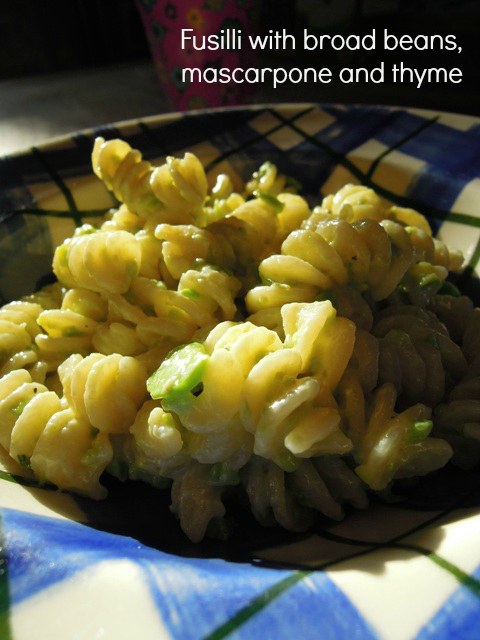 Cook the fusilli in a large pan of salted water according to the packet instructions. Drain and mix with the broad bean and mascarpone mixture. Add a little olive oil if it seems a little too dry or thick. 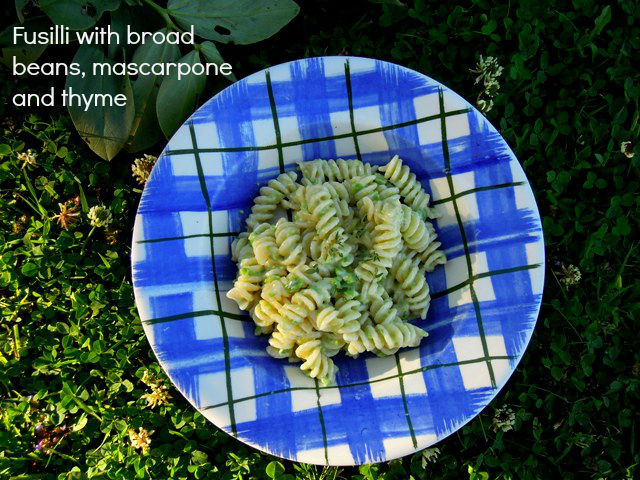 Serve with a little more thyme sprinkled on top. Summer on a plate – delicious. And as this dish features lovely fresh thyme, I’m entering it into this month’s Cooking with Herbs event hosted by Karen over at Lavender & Lovage.